Welcome to the second installment of my new series, “Baking with Hot Bread Kitchen!” You can read about my first bread adventure here. I returned to the kitchen last weekend for my second “multi-ethnic” bread-making adventure from The Hot Bread Kitchen Cookbook. I’d been planning to make rich and complex paratha, but my time and energy were in short supply, so I settled on the simpler chapati, a classic South Asian flatbread. I’d helped make chapati while facilitating a cooking class at work last fall; also, many of my Bengali and Indian students and co-workers make it regularly. Chapati requires just three ingredients: whole wheat flour, boiled water, and salt. What could be easier than that? As the cookbook mentions, mixing flour with hot water cooks the flour so that the flatbreads stay tender and pliable, even the next day. I recalled that you can actually buy special “chapati flour,” which is very finely ground. I used regular whole wheat flour for mine and it worked fine, although I may try using chapati flour next time to see if it changes the bread’s texture at all. My chapati turned out well. The recipe was so simple and the whole process took just under an hour, from initial mixing to 12 cooked flatbreads. I made them in parallel with F making chicken curry from Simply Delicious. The chapati were (was?) tender, soft, and great for scooping up chicken pieces in the curry. I took some leftover chapati to work the next day for my Bengali co-workers to sample — they were generous in their praise and told me it tasted like the “real thing.” An Indian co-worker recommended using a little less salt next time and drizzling leftover chapati with olive oil before packing and reheating them for lunch. I’ll try that next time — and yes, there will definitely be a next time for these quick and delicious flatbreads. Have you ever made chapati? Post your tips and tricks in the comments. Four Years Ago: Leftover Mashed Potatoes & Cooked Cabbage? Make Pyrizhky! Five Years Ago: PCVs, Unite! This entry was posted in Baking with Hot Bread Kitchen, culture, food, health, pictures, recipes and tagged baking, Bangladesh, Bengali, bread, chapati, curry, flatbread, Hot Bread Kitchen, India, Indian on 07.02.2016 by taplatt. Many of my go-to Indian dishes are originally inspired by / adapted from frugal feeding‘s recipes. This one is no different, and it’s a definite winner that will go into the regular dinner repertoire. Saag paneer is basically stewed spinach (or any type of dark greens) with paneer, a fresh South Asian cheese. Spiced with cumin, ginger, and garlic, and finished with plain yogurt, saag paneer makes a delicious and healthy weeknight dinner, especially with some fresh homemade naan on the side. F gave my saag paneer a “really good” rating — that’s high praise. For my saag paneer, I used frozen rather than fresh spinach. Perhaps fresh enhances the flavor, but I thought it worked just fine with frozen — and it’s cheaper. My paneer stuck to the pan when I tried to brown it, so that’s a work in progress. Two Years Ago: Viktor Mykolaiovych and Happy Mother’s Day! Heat some oil in a large pan and cook the cubed paneer until it’s golden brown on all sides. Remove the paneer from the pan and set aside; leave the oil in the pan. If using frozen spinach, thaw/cook it on the stove in some water. If using fresh spinach, blanch it in boiling water, then blend it in a food processor until smooth. While you’re cooking the spinach, sauté the ginger, garlic, and cumin in the pan with saved oil over medium-high heat until golden-brown and fragrant. Add the tomatoes and let cook until they’re broken down, about 5 minutes. Stir in the spinach and salt, then let the saag simmer for another 5 minutes. Add the paneer and continue cooking until everything is heated through. Stir in the yogurt just before serving, and enjoy with some naan and extra yogurt. This entry was posted in food, full meals, health, pictures, recipes and tagged Indian, naan, paneer, saag, saag paneer, spinach on 13.05.2014 by taplatt. I’ve made dal before and was pleased but not overly smitten with the result. This dal, on the other hand… We’ve made it multiple times in the past month — it’s that easy, that quick, and that delicious. F gets full credit for this, which he found by Googling (ah, Google) “dal recipe” one night when we wanted a quick protein to go with our roasted root veggies. He chose a recipe that came up near the top of the search results and it turned out well-spiced and flavorful. Enjoy it with roasted veggies, rice, naan/pita, yogurt, or just on its own. Heat the sesame oil in a medium pot over medium heat. When the oil is hot, add the chopped onion, garlic, and ginger. Cook, stirring often, until the onions are softening and translucent. Add the spices to the onion mixture and stir well to combine. Add the lentils and water to the pot; stir well. Bring to a boil, then turn the heat to low, cover the pot, and let the lentils simmer, stirring occasionally, for 20-30 minutes or until they are tender and the dal is at your desired consistency. Stir in the tomato paste at the end, if using. This entry was posted in culture, food, health, recipes and tagged dal, Friday dinner, Indian, red lentils, weeknight dinner on 29.03.2014 by taplatt. I’ve recently realized that a lot of Indian food is actually quick and easy to make. This chana and cauliflower masala is another Indian dish adapted from frugal feeding; at least two more of his Indian recipes are on my list to try. “Chana” means “chickpeas” in Hindustani, so this is a vegetarian stew-like dish made with chickpeas — I added cauliflower for even more health and texture. The dish has a nice spice profile and is great for a quick, warming Friday or other weeknight dinner. It’s also easy to double the recipe for more people. As has been the case in the past, this dish is more flavorful the next day, after the flavors have had time to blend and mellow. Serve this over rice — or not, as it’s hearty enough to stand alone — and feel free to stir in some plain yogurt to cut the spice and add some tang. Put the rice on to cook, if using. Place a medium pot of water on the stove over high heat. When the water boils, add the cauliflower and cook 5-10 minutes or until it is firm-soft. Drain and set aside. Sauté the onions in oil in a skillet over medium-high heat until they are translucent. In a separate, small skillet, toast the cumin and coriander seeds until they are fragrant, then grind them with a mortar and pestle. Add these and the other spices (through ginger) to the onions in the large pan and cook on low for 5 minutes, stirring frequently. Add the tomatoes and water to the pan and let simmer for 5 minutes. Add the chickpeas, garlic, salt, and cauliflower to the pan and bring the mixture to a boil, then let simmer for 10-15 minutes or until it thickens to your liking. Serve over rice — or not — and with or without a dollop of plain yogurt. This entry was posted in culture, food, full meals, health, pictures, recipes and tagged Friday dinner, Indian, leftovers, weeknight dinner on 18.12.2013 by taplatt. We’ve discovered that it’s way cheaper per pound/kilo to buy a whole chicken, roast it, eat some, then create another tasty dish with the leftover meat. In the past, we’ve used leftover chicken for buckwheat noodle salad and borshch, among other things. This week, I wanted to try something new. After scouring a few of my favorite food blogs, I settled on this Fragrant Chicken Biryani because we had almost all of the ingredients and it would make enough to feed us for another meal or two. And since roasting a whole chicken is pretty darn frugal, I thought it appropriate to use one of frugal feeding‘s recipes. At its most basic, biryani is a spiced rice dish with vegetables and/or some kind of meat. The technique is simple: Sauté onions and spices, cook some rice, add some meat or veggies, stir them all together, then pop them in the oven for 20 minutes. Voila: a one-dish meal! I followed frugal’s original recipe pretty closely, though we used more chicken and added leftover roast potatoes, which led us to adjust the spice measurements. We used brown rice in place of basmati. The biryani tasted delicious — F couldn’t stop nibbling at it, and each of us had a second helping. “Fragrant” is definitely a great way to describe this dish; turmeric lends a pleasant yellow color, coriander keeps things bright, red pepper flakes give it a kick, and the cinnamon deepens the flavors. You’ll love it. Start your rice cooking by covering it with 2cm (~1 inch) of water and bringing it to a boil, uncovered. Let it boil until most of the water is absorbed, then put a lid on the pot and turn the heat to low until the rest of the water evaporates. In a pan over medium-low heat, sauté the onions and spices in oil, stirring frequently, for about 10 minutes. Stir the potatoes and chicken into the onion mixture. Cook, stirring occasionally, over low heat until the rice is done. Preheat the oven to 150C (300F). When the rice is cooked, add it to the pan with everything else. Add the lime juice, and stir until combined. Pop the pan in the oven for 15-20 minutes. Stir in some fresh coriander before serving. Feel free to serve some raita or other yogurt sauce alongside. This entry was posted in culture, food, full meals, health, pictures, recipes and tagged Friday dinner, Indian, leftovers on 04.09.2013 by taplatt. Having bought double cream for use in this strawberry “mousse” but not having used it all, I thought it would make a delicious complement to a warm mug of chai tea. The problem? No chai tea bags. Just black tea. The solution? Make my own chai! After trolling around on various blogs to learn about the necessary spice profile for chai, I filled the trusty electronic kettle and turned it on. While the water was heating, I put two black tea bags along with some spices into our blue polka-dot (polka-dotted?) teapot. The water boiled. I poured it into the teapot, put the lid on, and let it steep for 10-15 minutes. When I returned to the kitchen, I vigorously mixed just a pinch of sugar — I am not generally a sugar-in-hot-drinks person — into some of the double cream. 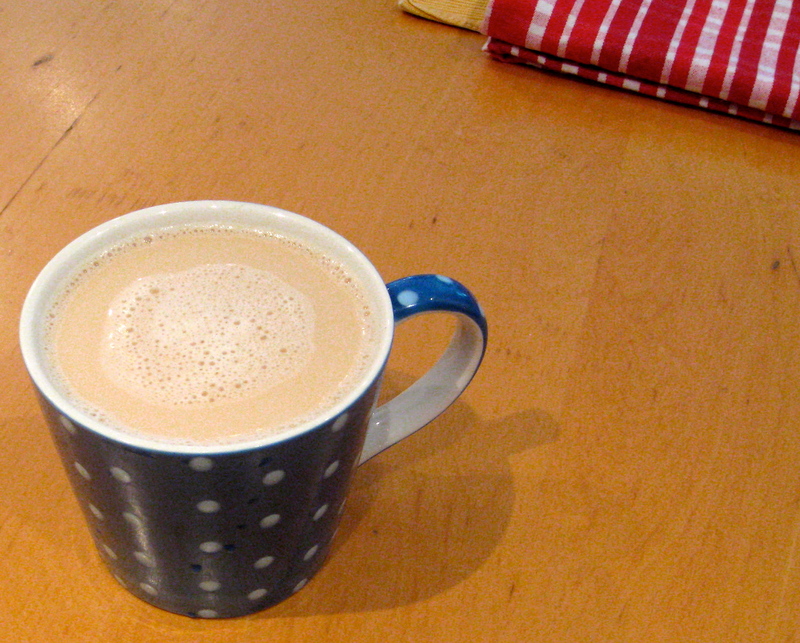 Then I poured that into my matching blue polka-dot mug and filled up the mug with hot homemade chai tea. My reaction after the first swallow: “heaven in my mouth.” I don’t know if it was the double cream or the spices that did it, but that was one good cup of chai. Warm, well-rounded, richly spiced, a tiny bit sweet. Satisfying, comforting. So good I had no need for a sweet treat on the side. 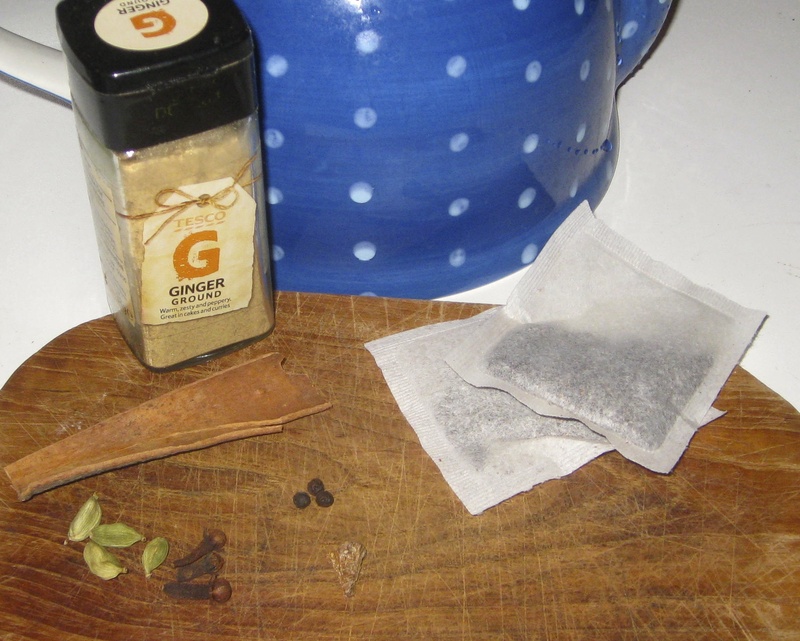 Trivia tidbit: “chai” merely means “tea” in many languages, including Ukrainian and Swahili. Set the water on to boil. Meanwhile, combine the tea and spices in a teapot. When the water boils, pour it into the teapot. Let steep for 10-15 minutes, then remove the tea bags. After removing the tea bags, mix together the cream and sugar in the mug you will use. Pour the tea over the cream, take a sip, and sink into a blissful state. This entry was posted in food, health, pictures, recipes and tagged Indian on 19.06.2013 by taplatt.